Happy to announce Kirtan meetup for this Month. 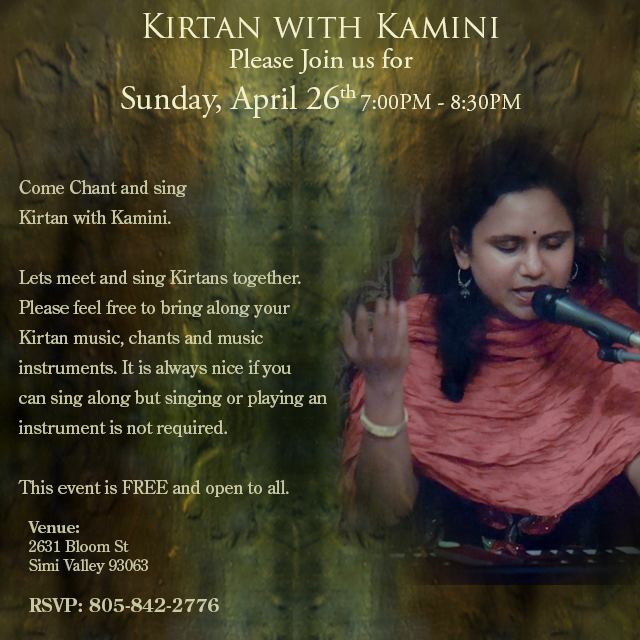 Lets meet and sing Kirtans together on Sunday April 26th 2015 at 7:00PM. Kirtan is a call and response style of singing and chanting together various Mantras. Man means mind, Tra means that which frees. Kirtan music is one of the oldest scared traditions of the world that originated in India. Using ancient Sanskrit mantras, the kirtan calls upon sacred energies which serve to quiet the mind, remove obstacles, and bring us back to the center of our being.